One of the most perplexing decisions a traveler has to make concerns the choice of designing your own trip or joining a pre-arranged tour. As with everything in life, there are positives and negatives for each version. Group tours have the advantage of leaving the work of organizing and coordinating up to an "expert" who has probably done this many times before and has made the necessary contacts to insure that the trip runs smoothly. Transportation is usually by bus or van (depending on the size of the group) and all admissions, fees, etc. are taken care of by the tour company. Another advantage is that the tour guide is usually extremely knowledgeable about the sights and attractions so you can get a great amount of information to better appreciate the sights. Accomodations are usually very good (with a reputable company) and, typically, several meals are also included, so that your up-front cost is usually very close to the final expense of a trip. Another benefit is that you don’t really have to learn the language of the countries you are visiting since the tour guide takes care of the majority of negotiations and communications. In addition, if difficulties arise, they are the responsibility of the tour company. Disadvantages of group tours include the rigid schedule which is typically adhered to, the fact that choices about what to see and when is pre-determined and may not be what you, the traveler, would have done in a particular place. One often gets the feeling of being a "sheep", dutifully following the rest of the herd. Another complaint is that there is never enough time built in for relaxation, stopping to enjoy a beer or a coffee in an outdoor restaurant, for instance. 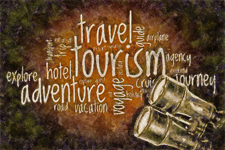 Another common circumstance is that tours frequently stop for shopping at designated vendors (which, you can be sure, are providing a kickback to the tour operator) which are certainly not the cheapest places to find travel treasures. Because of these negatives, many wonder if this type of travel can ever be "authentic", although the majority of tour participants probably don’t really care as long as they are seeing the sights they paid to see. Traveling on-your-own is fraught with stress and sometimes danger. If things go wrong, YOU must rectify the situation, YOU must solve the problem. Driving in foreign countries can be extremely trying because maps may be inadequate, roads may not be well marked (sometimes you will find yourself driving on the opposite side of the road from what you are used to). You must plan, usually well in advance, your accomodations, route, sights to be included, and meals. Although it is possible to have a good estimate of the trip’s overall expense, it is always just an estimate and is frequently incorrect. Language issues must always be addressed and these can be formidable (requiring much advance preparation). The beauty of traveling on your own is that you will be engaged in what YOU want to do, going where YOU want to go, and staying as long as you like. If you don’t mind the advance planning, you will find that it enhance the overall experience — there is a much greater sense of anticipation because this is YOUR trip. You can schedule rest and relaxation time to prevent travel-overload, that feeling of being impelled from sight to sight with no breather or time for contemplation. In conclusion, it seems that there are numerous reasons to choose either method of travel. Probably, the most important consideration is how YOU feel about traveling. I, personally, prefer, whenever possible, to travel on my own because I truly enjoy the planning process, learning about the various places, using maps to find the best route to get from point A to point B, and then creating an itinerary with every detail considered. I even create a list of possible restaurants which we can choose from at each destination. My trips tend to be extremely ambitious (that is, I like to cram many stops into my schedule, even though I understand, in advance, that some of them will have to be left out), but I have learned (as a result of negotiations with Lee) to schedule time for shopping and for relaxation. I also recognize that sometimes it is better to take a group tour. For instance, we will be traveling to China and Bangkok next year, and I will be using a packaged tour because I feel that travel in these countries is probably much more difficult than travel in the US, or Europe, or Mexico. No matter what YOU choose, traveling is the important thing!